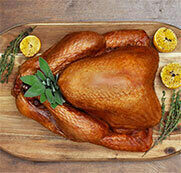 Two days before roasting the turkey place the turkey in a large pot or container big enough to submerge it. Ensure that the giblets have been removed and the cavity is clean. Take the brined turkey out of the fridge, drain the brine and pat the Turkey dry. 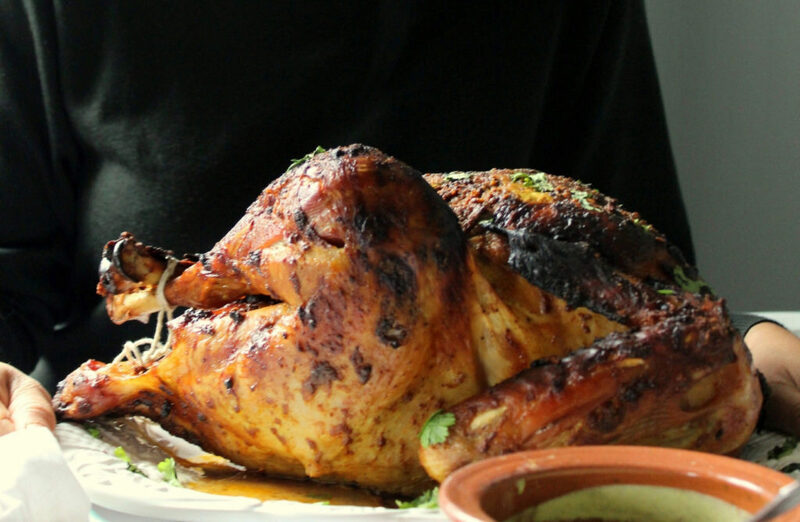 Place the turkey in a dish – you can use the roaster you will roast it in as well. Whisk the marinade ingredients except the butter in a bowl. Reserve the squeezed lemons for later. Now with clean hands (or gloves) lift the skin at the bottom of the turkey breast, it will separate from the breast meat. Stuff about 1/5 of your marinade mixture into each breast half. Shmear the rest over the back, legs, and wings of the turkey. If using butter it may not go on like a smooth even paste but that's fine! Stuff the cavity with the juiced lemons. Leave uncovered in the fridge. Preheat the oven to 450, place the oven tray on the last rack. Drop the temperature to 350 C, tent the turkey with foil and roast until a meat thermometer inserted in the thigh reads 170 degrees Celsius, this took me another 1 hour and 50 minutes over and above the initial bake time. Let the turkey meat rest for at least 20 minutes before carving. Serve with the green chutney, parathas, and a simple sabzi pulao. Blitz half a cup of yogurt, mint leaves, cilantro leaves, the salt, red chilli powder, green chillies, and garlic in a food processor till smooth. Pour into a bowl and whisk in an additional cup of yogurt. Notes: You can sub any neutral oil for the butter in the marinade recipe, it will give you a smoother paste. However I do suggest basting with a little melted butter then right at the end for optimal flavour!